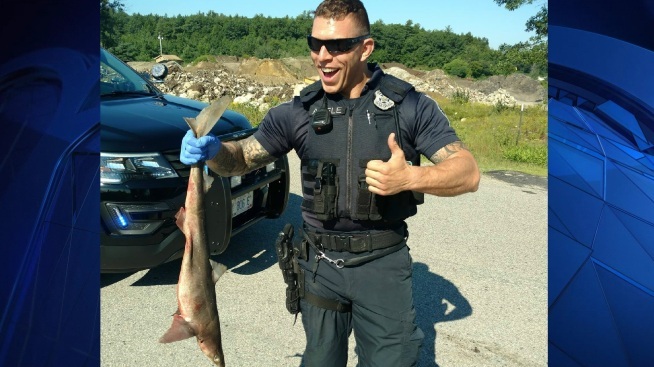 A Brentwood police officer poses with the dogfish he "caught" in the middle of a local street. Police officers in a small New Hampshire town made a rather bizarre discovery on Wednesday. Brentwood police said two officers were patrollling on Pine Road on Wednesday morning when they located four dead dogfish sharks in the road. They said it appears the dead sharks had been previously caught and were either discarded or fell from a vehicle. New Hampshire Fish and Game has been notified. The dogfish is the most common type of shark. They are about 3 to 4 feet long on average.